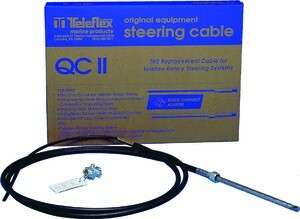 This replacement steering cable fits most Teleflex rotary steering applications from 1968 to present. Fits old style (threaded) Safe-T, Big-T, Safe-T,Big-T,Safe-T Quick Connect & NFB helms. No tools required Quick Connect attachment included for easy installation. Look for our other steering parts or call us for used parts. ** Be sure to call us to check our USED boat part inventory for this marine product or a similar product. We have thousands of used boat parts in stock and shippable today in most cases! Call today and talk to the boat expert! 281-999-BOAT. **Be sure to call us to check our USED boat part inventory for this marine product or a similar product. We have thousands of used boat parts in stock and shippable today in most cases! Call today and talk to the boat expert! 281-999-BOAT. Copyright © 1996 Page Concepts. All rights reserved.